Wear, corrosion, material fatigue are signs of degradation that are common to most materials. This makes it all the more important to detect damage early, preferably on the micrometer scale. Magnetic test methods are often used for this purpose, which was previously impossible with non-magnetic steel. Researchers from Kaiserslautern and Mainz have now developed a process in which they apply a thin magnetic layer to steel. Changes in the microstructure can thus be detected by changes in magnetic effects. Materials such as aluminum can also be tested in this way.The corresponding paper has been published recently in the Journal of Magnetism and Magnetic Materials. Steel is one of the most frequently used materials. We use it in many variants, for example in the form of stainless steel, high-strength quenched and tempered steel, or low-priced structural steel. Steels can be magnetic or non-magnetic. They are used in cutlery, in automotive components, in steel girders of buildings, and in bridges. At times, steel is exposed to high temperatures and stress. "This can result in microstructural changes, cracks, or component failure," said Dr. Marek Smaga, a researcher at the Department of Materials Science at Technische Universität Kaiserslautern (TUK). This is what experts refer to as material fatigue. Initially, such damage is only visible on the micrometer level. With magnetic testing methods, however, it is not yet possible to detect changes in this scale in non-magnetic steel at an early stage. Engineers from TUK and physicists from Johannes Gutenberg University Mainz (JGU) are working on this problem and are presenting a solution in their current study. The unique feature of their method is that it makes use of magnetic effects, even if the material being tested is non-magnetic. 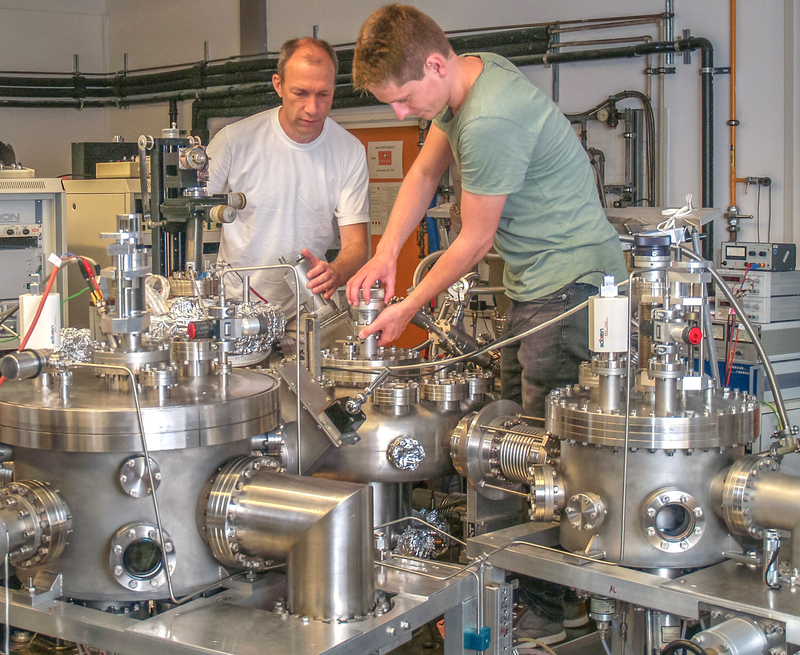 The Mainz-based researchers coated a non-magnetic steel with different magnetic films, each 20 nanometers thin and composed of terfenol-D, an alloy of the chemical elements terbium, iron, and dysprosium, or of permalloy, a nickel-iron compound. The physicists then used a so-called Kerr microscope to check whether strains of the steel can be detected in the microscopic range. "This is achieved using the so-called Kerr effect, which allows the magnetic microstructures, the so-called domains, to be imaged by rotating the polarization direction of light," explained Dr. Marek Smaga. The scientists examined magnetically coated steel plates a few millimeters thick that had previously been exposed to mechanical stress. "We observed a characteristic change in the magnetic domain structure," explained Dr. Martin Jourdan from the Institute of Physics at JGU. "Microscopic strain in non-magnetic steel causes the direction of magnetization of the thin layer to change." Compared to conventional testing procedures, this method has the advantage of detecting signs of fatigue much earlier as it is effective at the micrometer level. The researchers' method could be used in new testing techniques in the future. In addition, the technique is not only interesting for non-magnetic steel. Other materials such as aluminum, titanium, and certain composite materials could also be treated with such a layer. The project was part of the work undertaken by the Transregional Collaborative Research Center (CRC/TRR) "Spin+X: Spin in its collective environment", which is based at TU Kaiserslautern and Johannes Gutenberg University Mainz and financed by the German Research Foundation (DFG). The CRC/TRR involves interdisciplinary teams of researchers from the fields of chemistry, physics, mechanical engineering, and process engineering, who undertake research into magnetic effects that are to be transferred to application. The primary focus is on the phenomenon of the spin. Physicists use this term to refer to the quantum mechanical momentum of a quantum particle, such as an electron or proton. This forms the basis of many magnetic effects. https://www.uni-kl.de/trr173/home/ - Transregional Collaborative Research Center 173 "Spin+X: Spin in its collective environment"